Arlington, Virginia (CNN) -- After mostly avoiding the spotlight for decades, many of the former U.S. Secret Service agents who were assigned to protect President John F. Kennedy are now offering their accounts of the day he was assassinated, 47 years ago Monday. After the first shot hit the president, former agent Clint Hill says, "I saw him grab at his throat and lean to his left. So I jumped and ran." 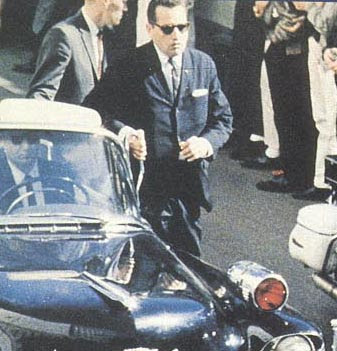 Hill is the man seen running toward the limousine in the famous film of the shooting, captured by a bystander named Abraham Zapruder. Hill jumped onto the back of the presidential car, in a desperate attempt to protect the president. "Just before I got to the car, the third shot hit him in the head." Hill says. "It was too late." First lady Jackie Kennedy had climbed onto the back hood of the car, but Hill moved her back into her seat, and attempted to shield the two of them from any further bullets, as the car sped to the hospital. As the president's head lay in her lap, Hill heard Mrs. Kennedy say, "Oh, Jack, what have they done to you?" A newly detailed account of the assassination is laid out in the new book "The Kennedy Detail," by former agent Jerry Blaine, written with journalist Lisa McCubbin, based on interviews with many of the agents who covered Kennedy. Former agent Hill, who has rarely granted interviews about the shooting, wrote a foreword. Blaine and Hill say they are still burdened by the knowledge that they were unable to keep the president safe that day in Dallas, Texas. "There's no question in my mind he was the assassin," Hill says. "I was there. I know what happened." Blaine reveals for the first time that on the very same day that Kennedy was killed, newly sworn in President Lyndon Johnson was almost shot as well -- accidentally. Just hours after Johnson was sworn in aboard Air Force One, Blaine was guarding his home, after going 40 hours without sleep. "It was about 2:15 in the morning at The Elms, which was Johnson's residence before he became president. I heard all of a sudden a person approaching," Blaine says. He raised his gun and put his finger on the trigger -- only to see Johnson round the corner. "He turned white, he turned around and walked in, and that was the last that was ever said of it," Blaine says. "We couldn't help, but we felt like we failed," says Blaine. "It was a terrible feeling." Hill was commended for the bravery he showed under fire, but even so, he says he holed up for years in his basement with alcohol and cigarettes, feeling guilty that he did not reach the limousine in time to take a bullet for the president. "I felt that there was something I should have been able to do," he says. "Moved faster, reacted quicker, gotten there just moments quicker, could have made all the difference in the world." Hill suffered nightmares, but post-traumatic counseling was not yet a common practice. Only with the passing of many years did he gradually recover, telling himself he did the best he could. "You just have to accept it and live with it, the best you can," he says. Just days before the assassination, Blaine writes, Kennedy chafed at the close proximity of his protective detail. During a motorcade in Tampa, Florida, he asked them not to ride on his limousine. "Have the Ivy League charlatans drop back to the follow-up car," the president told one of the agents. "We've got an election coming up. The whole point is for me to be accessible to the people." But Hill and Blaine dismiss the notion that Kennedy's instructions in Tampa jeopardized his security in Dallas. Photos of the motorcade show, regardless of what the president said, Hill was riding on the back of the car during an earlier part of the route. By the time the motorcade reached the stretch of roadway where the assassination occurred, however, agents could no longer ride on the fenders, Blaine says. "We were going into a freeway, and that's where you take the speeds up to 60 and 70 miles an hour. So we would not have had any agents there anyway," he said. Some of the agents see the book as a chance to counter some of the conspiracy theorists who have never accepted that it was Lee Harvey Oswald who shot the president, and that he acted alone.